• This training plans in the packet are included with the other 200+ MTI Plans that come with an Athlete's Subscription. The 7 training plans contained within this packet details 52 weeks (approx 13 months) of training in preparation for attending a Ruck-Based Selection such as the U.S, Special Forces Assessment and Selection (SFAS) and “The Activity.” Start the plan exactly 52 weeks before your first week at selection. This packet is organized so that each plan will build your fitness for the next. The purpose is to build sufficient fitness to excel in selection regardless of your initial fitness level. It’s very important you complete the final, Ruck-Based Selection Training Plan the 8 weeks directly before you report for selection. The Ruck-Based Selection Training Plan includes a taper, so there’s no need to take rest week after it’s completion. The price for this packet of plans represents about 30% savings over the combined price of the individual plans. Ruck for rucking and ruck running. 10# sledge/dumbbell. Click the “Sample Training” tab at each individual training plan product page to see the entire first week of programming for that plan. What if I don’t have 52 weeks before selection? Most athletes will want to begin training with the Military On Ramp Training Plan, and all will want to finish with the Ruck Based Selection Training Plan directly prior to selection. The order and selection of the plans in the middle depending on the time you have to train. Please email coach@mtntactical.com for specific guidance. "Just wanted to thank you for your ruck based selection packet. I followed it from humility to the actual selection training plan (Was only able to complete 5 weeks of the selection plan due to timing issues). I recently returned from SFAS and was selected and a large part of that was due to your programming. I was prepared physically and mentally for all events. I'll spend a week or so recovering then I'll start your airborne school training plan followed by your q course plan. It's comforting to know that I won't have to go digging for fitness plans for the rest of my career as long as you guys keep pumping out solid results. Thanks again!" I wanted to thank you for all the great programming and advice. I recently attended my unit's SFRE (a mini-SFAS based event that screens and selects candidates to go onto SFAS) and was one of several selected. I owe a large portion of the success to your insights and training programs, specifically the ruck based selection packet and daily operator sessions. We did multiple events virtually back to back over the four day period such as timed 2 mile and 4 mile runs, timed 6 mile and 12 mile rucks and also many team events. Everything we did involved rucking over long distances as well. Being able to perform to the standard was difficult given the short breaks between timed events and overall sheer volume placed on our bodies from the rucking. Thanks Rob, couldn't have done it without the great programming!" "I want to start off by saying thank you. Your Ruck Based Selection Program is an excellent training regimen. I attended SFAS last month and was selected! Your Ruck Based Selection Program helped immensely. I felt more than adequately prepared for the rigors of SFAS. I know the MTI team is always modifying their training programs and looking for ways to improve. I am by no means an expert in physical fitness but I do have a few layman's comments that may help out in future versions of the Ruck Based Selection Program. 1. After the first two weeks of the program I cut out the IBA runs altogether. I personally felt that I needed more recovery time during the program and to my knowledge there are no IBA runs during selection itself. I am sure you have good reasons for including loaded runs during the program, but I felt better prepared to conduct the rucks and unloaded runs after cutting out the IBA runs. After going through selection I feel like this was the right call in my case. 2. Prior to SFAS I felt like I was not getting enough APFT and distance running work. This fear turned out to be unfounded as I ended up scoring 300 on the SFAS APFT and ran the fastest 2-mile of my career! 3. The sandbag-based work capacity events were absolutely perfect training for Team Week at SFAS. In hindsight I would even consider progressively ramping up the weight of the sandbag from 60 to 100ish pounds. Candidates carry enormous amounts of weight on their backs during team week and I feel that the sandbag-based strength workouts correspond very well to those events. 4. The long rucks on Saturdays can seem extreme during the program but they are the most critical events to prepare for SFAS. I would encourage anyone preparing for SFAS to not cut these rucks short, because they will be rucking even further during selection. Thanks again for developing this program. I hope the comments help out!" 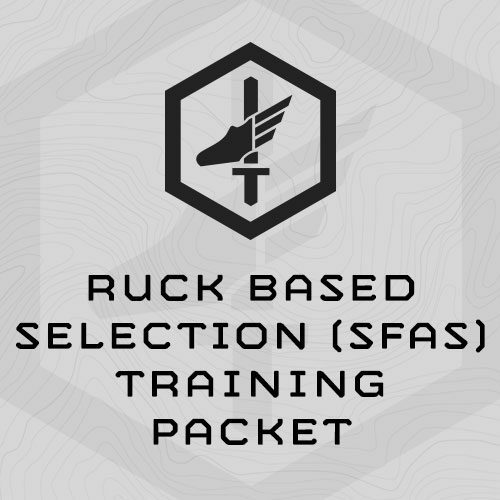 "Completed your Ruck Based Selection Program in the weeks leading up to my SFAS date earlier this month. I definitely felt prepared for everything that was thrown at me during the course and was luckily 'Selected' to top it off. Just wanted to say thanks for the knowledge and work that is poured into your programs. Without them I don't know how well I would have done." "I just recently returned from SFAS this weekend and wanted to reach back out to MTI to say thanks for the quality training program and for making the coaches so accessible throughout the process. I'm happy to report that I was selected and felt great throughout the course. I was able to continue performing long into the course when so many of my peers began to deteriorate. I'm taking a week off and then getting right back after it in preparation for the Q Course. The grip training, heavy rucks, and run/ruck intervals were the key pieces that I believe made me overall successful. Again, thanks to you and the MTI crew for pointing us in the right direction and making our goals obtainable."